Valerie Jarrett, arguably the most powerful adviser in the White House, sat down for a lengthy interview with Reuters Impact Players host Robert Wolf. Jarrett explained the strategy to take policy initiatives directly to the American people and make sure their voices help put pressure on Congress to break gridlock. 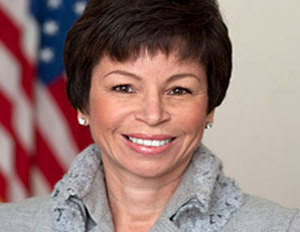 The president “isn’t going to simply rely on the inside game to get the work done, we need to have an outside game,â€ Jarrett said. Jarrett also addressed the improved relationship between the White House and big business, saying the two are much more in step today than they were during the president’s first term. The Chicago native also talked about violence in her hometown and the need for comprehensive gun control reform in the wake of the Newtown shootings. Wolf also asked Jarrett several questions from Black Enterprise on the importance of Black History Month and her greatest role models.